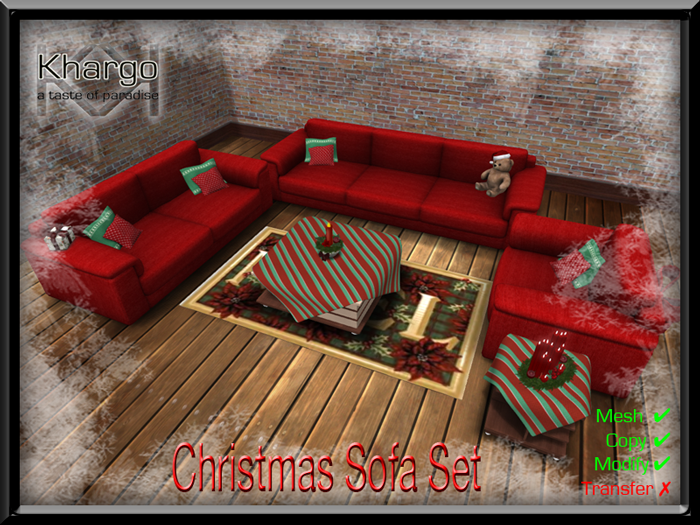 Khargo has been creating Christmas for 5 years now and we're pleased to announce the reopening of our Christmas and Winter store! We're kicking off our Holiday offerings with our first mesh sofa set which has a festive feel. Some animations also give an item or rez a prop when you choose the appropriate animation. To go with the sofa set you have to have a fireplace! Perfect for dreaming away those winter nights, toasting marshmallows or warming up there are 13 animations to choose from. It also has a fireplace menu to turn the flames off and on with various options to customise it further. There is also space to put your own pictures in the frames on the mantle. Every Christmas we try and make a new Tree. This year we have 2! With an eye on land impact we created a much lower tree than last year at 19 LI. It contains 6 single animations and also rezzes props and items when you change poses depending on the animation. Even lower Land Impact is the Alternative Christmas Tree. 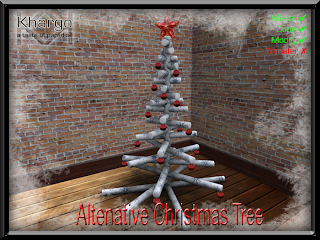 This contemporary tree comes in 2 versions - the decorated version has a Land Impact of 19 and the low, undecorated version has a LI of only 10. 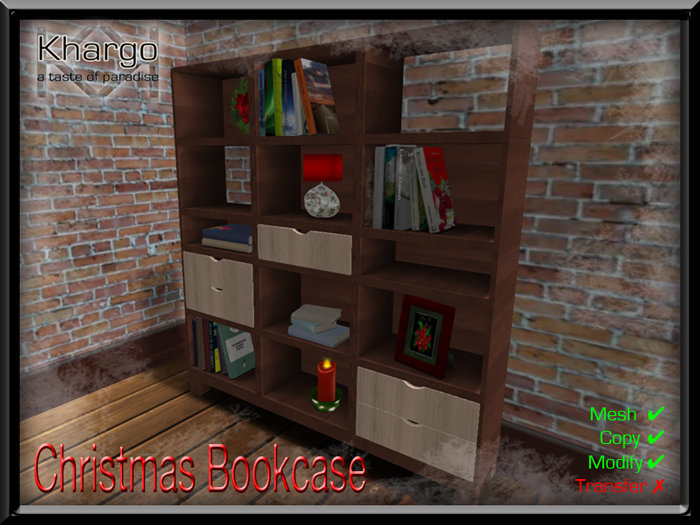 Finally in this 1st Christmas release, we have the Christmas Bookcase. 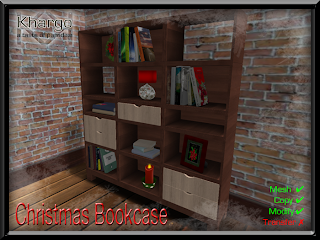 The perfect companion to the Christmas Sofa Set, this modern bookcase is decorated for the holiday season with a festive lamp, candle, frame and wreath. There is also spaces for you to add your own items or Christmas cards. It has a land impact of 14... and a few interesting books! 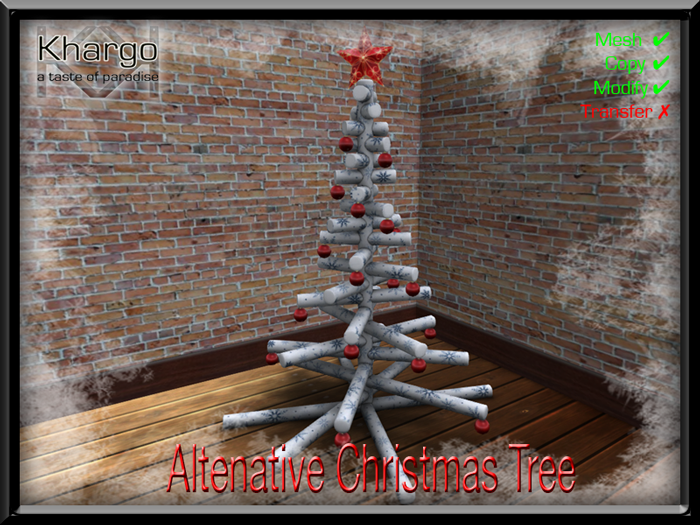 Hope to see you at Khargo Christmas soon! Khargo Christmas Gatcha - and an Iceberg!